Tyndell Portrait Boxes are rated among the highest quality in the industry. Our boxes are designed to offer the absolute best combination of quality and price. You will not find a better constructed portrait box at a more economical price. Tyndell Portrait Boxes are an excellent way to deliver your customer orders. They are designed to accommodate many popular print sizes. 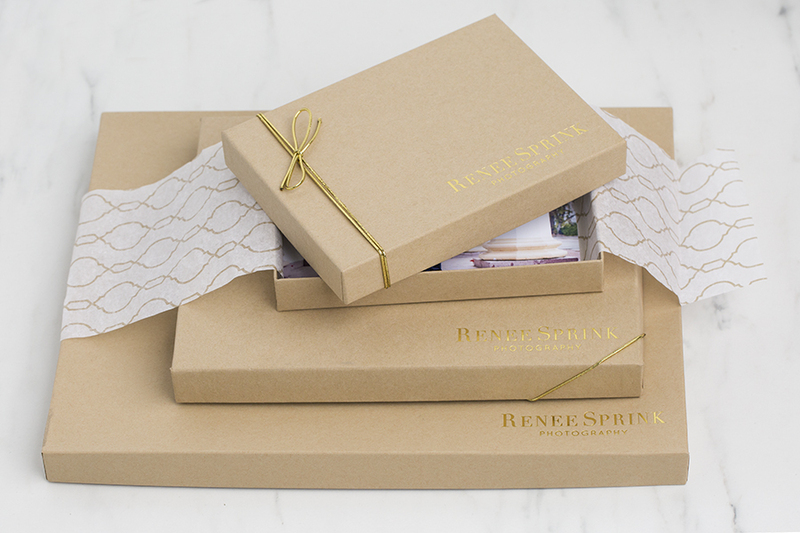 Complete your photo packaging by imprinting the portrait boxes with your studio die. Accessories shown are sold separately. *We have updated our Kraft 1" Portrait Box color to match our Kraft Photo Cases and Deluxe Kraft Portrait Boxes for a more consistent look. These are our remaining darker colored Kraft 1" Portrait Boxes. Free imprinting with your studio die when you purchase 100 or more boxes. Rate our Kraft 1" Portrait Box - Clearance.